A short walk from Ryōgoku station to Ryōgoku Kokugikan. Ryōgoku Station (両国駅 Ryōgoku-eki) is a railway station in Yokoami, Sumida, Tokyo, Japan. Ryōgoku Kokugikan (両国国技館 Ryōgoku Kokugikan), also known as Ryougoku Sumo Hall, is an indoor sporting arena located in the Yokoami neighborhood (bordering to the Ryōgoku neighborhood) of Sumida, one of the 23 wards of Tokyo in Japan, next to the Edo-Tokyo Museum. 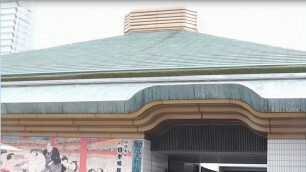 It is the third building built in Tokyo associated with the name kokugikan. The current building was opened in 1985 and has a capacity of 11,098 people. It is mainly used for sumo wrestling tournaments (honbasho) and hosts the Hatsu (new year) honbasho in January, the Natsu (summer) honbasho in May, and the Aki (autumn) honbasho in September. It also houses a museum about sumo.